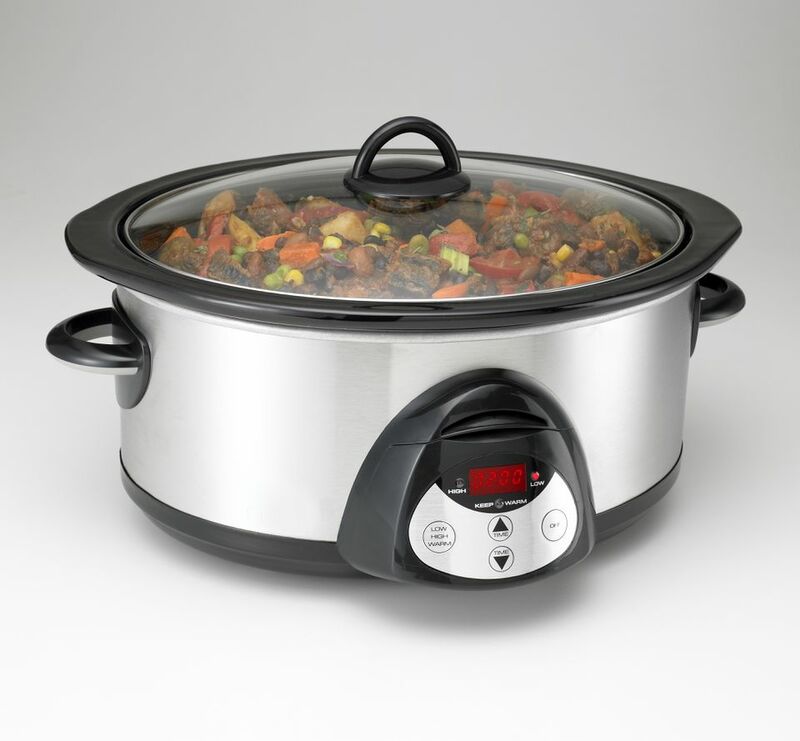 Many crock pot recipes can be altered to include fewer ingredients with no loss in flavor or quality. Just make sure that the recipe ingredients you eliminate aren't essential, like the broth in a soup or binders in meatloaf. You can, of course, add more ingredients to any of these super-easy recipes for appetizers, entrées, and side dishes as you see fit. What could be simpler when throwing a party than to create a five-ingredient appetizer by tossing everything in the crock pot and letting it simmer away while you finish your preparations? Here are some ideas. Crock Pot BBQ Chicken Drummies Recipe: You can use your own barbecue sauce in this super-easy five-ingredient recipe, or purchase one. The spiciness of the finished dish will depend on the barbecue sauce hotness. Crock Pot Applesauce Kielbasa Recipe: This is a hearty fall meal that is rich, sweet and spicy, with brown sugar and mustard, and fully cooked smoked sausage. Crock Pot Reuben Dip Recipe: This is perfect for a spread for football watchers. The combination of salty corned beef, crunchy sauerkraut, cream cheese, Swiss cheese, and tangy Thousand Island dressing is fabulous. Crock Pot Enchilada Dip Recipe: This recipe beats all the others because only four ingredients—chicken, enchilada sauce, cream cheese, and pepper jack cheese—are necessary to pull off this tasty appetizer with a Mexican flair. The luxury of having a hot meal ready and waiting for you when you and your family get home is a reality with these five-ingredient crockpot recipes for beef, chicken, turkey, and pork entrées, and the side dishes to go with them. Crock Pot Cajun Pot Roast Recipe: There is no better way to cook pot roast than in a slow cooker and adding Cajun seasonings is a fun change to a classic recipe. This easy five-ingredient recipe is perfect for any cold winter day. Crock Pot Spaghetti and Meatballs Recipe: This recipe is perfect as is, but you could add more veggies like chopped bell peppers, grated carrots, or garlic. Serve this dish with some toasted garlic bread and a green salad tossed with tomatoes and mushrooms. Crock Pot Cheesy Chicken Recipe: This super simple recipe is made with only three ingredients, five if you count the pepper and chili powder. Use boneless, skinless chicken breasts or thighs. Crock Pot Turkey Recipe: Imagine a Thanksgiving-like dinner waiting for you after work and all it took was three ingredients and a 7-hour cook in the crock pot. Crock Pot BBQ Ribs Recipe: This recipe requires only four ingredients for fall-off-the-bone barbecue any time of year—cola, ribs, barbecue sauce, and thyme leaves. Crock Pot Easiest Pork Chops Recipe: This three-ingredient has to be one of the fastest recipes that require work from you. Just plop the ingredients in the slow cooker and turn it on. Come back about 7 hours later for a great meal with a wonderful sauce you can serve over mashed potatoes, rice, or polenta. You've got the appetizer and the main course covered, so how about a side dish cooked in a smaller crock pot timed to be ready when the entrée is ready. Crock Pot Cheesy Potatoes Recipe: This super simple and rich side dish uses frozen hash brown potatoes in a wonderful four-ingredient recipe. It's perfect for entertaining and the holidays. Crock Pot Apple Stuffing Recipe: Consider this dressing to accompany your crock pot-cooked turkey for Thanksgiving, Christmas or any time of year. The applesauce provides a sweet and tangy taste to this traditional dish.